Lhakar for me is a day on which I celebrate my Tibetanness. 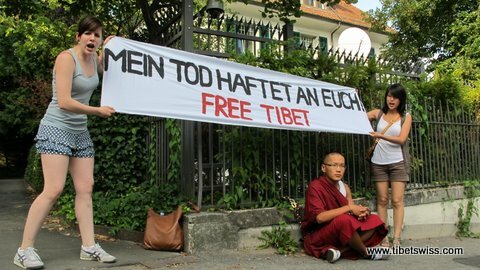 Although we were born and raised in Switzerland, although we have never seen our homeland Tibet, we are totally aware of our Tibetanness. Lhakar is the day to show it! No matter how: in speaking Tibetan (and really focusing in not using any Swiss-German words – very hard! ), or visiting a Tibetan restaurant with my Tibetan friends (who doesn’t like momos?). But the most important thing I think is just to do something for our people on this day. A week ago, I had arranged to meet my best friend, a Swiss girl, in Zurich to enjoy the sunny weather by the Zurich Lake. But just yesterday I remembered that Wednesday’s going to be Lhakar. I thought about canceling on my friend but I had done this so many times before so I couldn’t. But I still wanted to do something for Lhakar so I just printed the photo of Tsewang Norbu and decided to take a little action with my best friend inspired by Karma and Sonam. 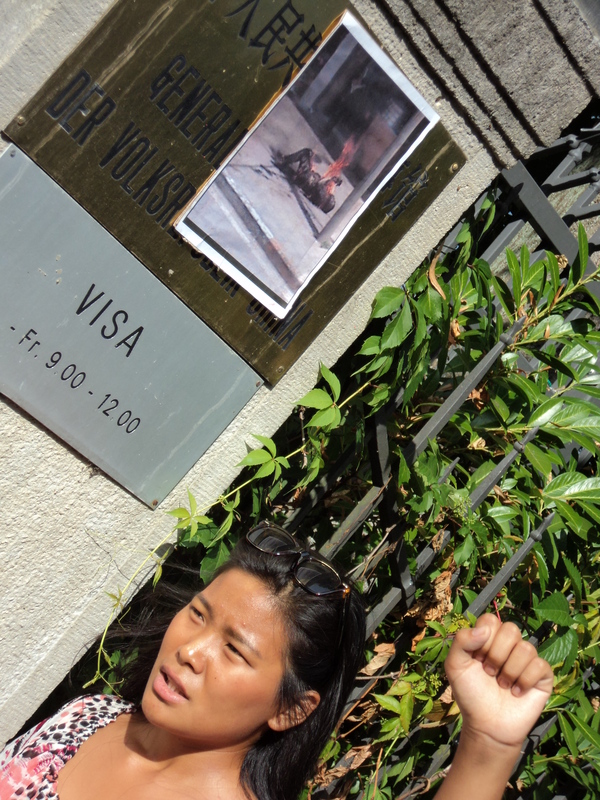 My Swiss friend was surprised but she totally agreed, and thanks to her I now have photos to put on Facebook and hopefully motivate other young people to do something on Lhakar and for Tsewang Norbu. 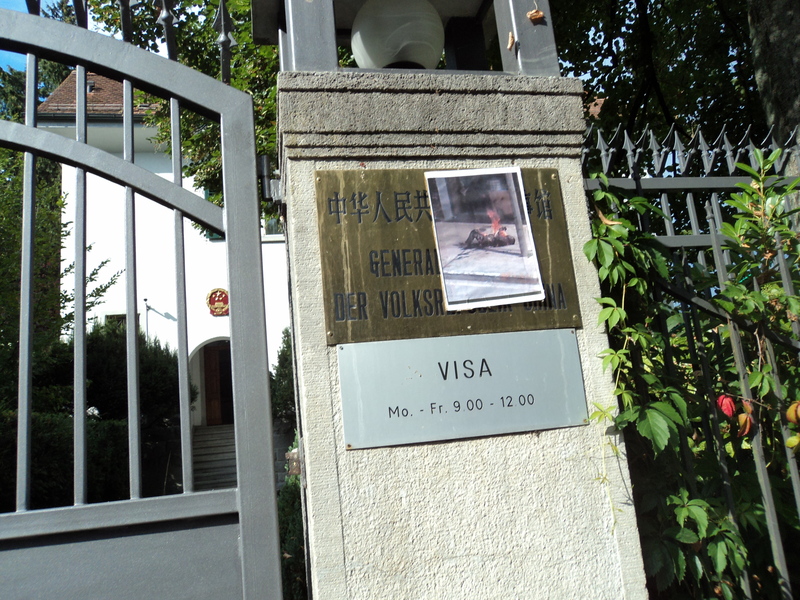 We took our bicycles and made our way to the Chinese consulate. I put the photo to the signboard which only took me two minutes. 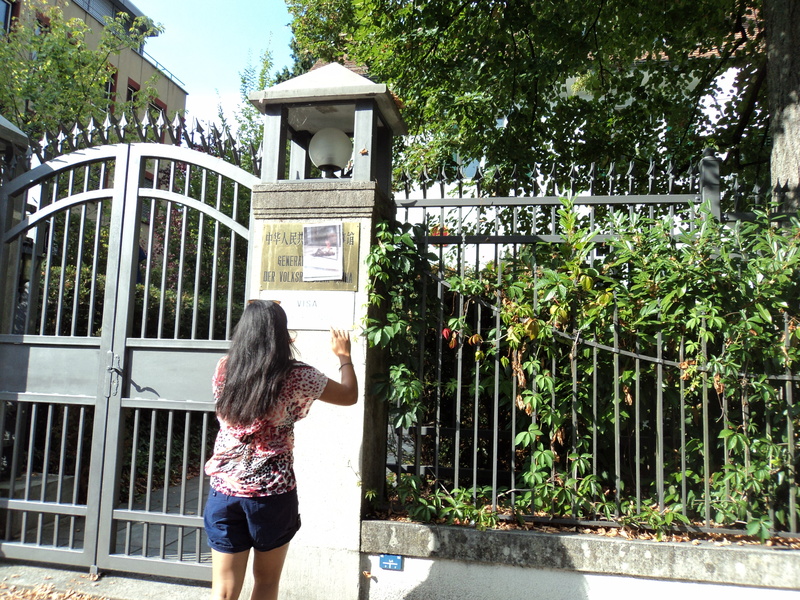 When I noticed that the Consulate’s door was open I screamed, “FREE TIBET!” and we biked away. Afterwards we celebrated our success with sushi dinner at the Zurich Lake. So today I did something for Tibet without having to let my best friend down. This should be a motivation to everyone. We always think that taking action has to be so damn serious and complicated, but hey it is not! If you have an idea, just do it! Tibetans inside Tibet are so courageous, brave and fearless. Since 2009 there have been three monks who immolated themselves to call for a free Tibet and the return of His Holiness the Dalai Lama to Tibet. Tibetan people started this amazing and clever non-cooperation movement called Lhakar in 2008. Our brothers and sisters inside Tibet are doing incredible things to survive the Chinese occupation as Tibetans. So the reason why I did this today and why I try to be proactive in the Tibetan movement are the Tibetan people inside Tibet. It makes me proud to be Tibetan when I see their courage and their selflessness. 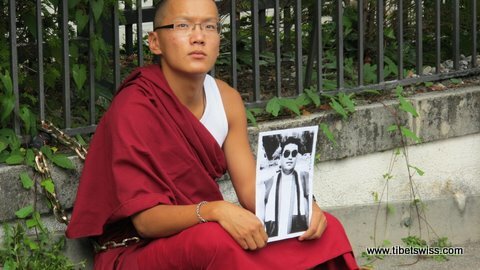 This is why every young Tibetan around the world should do something at least one day in the week for the Tibetan cause!